Before the discovery of the Hiawatha impact crater, scientists generally assumed that most evidence of past impacts in Greenland and Antarctica would have been wiped away by unrelenting erosion by the overlying ice. Following the finding of that first crater, MacGregor checked topographic maps of the rock beneath Greenland’s ice for signs of other craters. Using imagery of the ice surface from the Moderate Resolution Imaging Spectroradiometer instruments aboard NASA’s Terra and Aqua satellites, he soon noticed a circular pattern some 114 miles to the southeast of Hiawatha Glacier. The same circular pattern also showed up in ArcticDEM, a high-resolution digital elevation model of the entire Arctic derived from commercial satellite imagery. 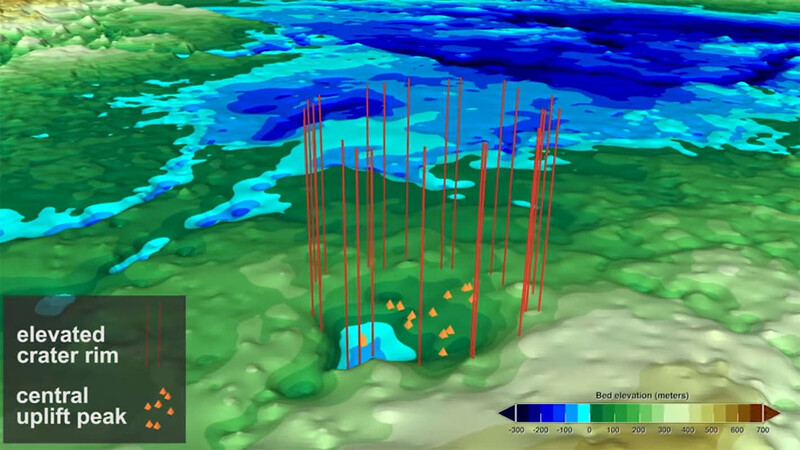 MacGregor reported the discovery of this second possible crater in Geophysical Research Letters on February 11th. Although the newly found impact craters in northwest Greenland are only 114 miles apart, they do not appear to have been formed at the same time. From the same radar data and ice cores that had been collected nearby, MacGregor and his colleagues determined that the ice in the area was at least 79,000 years old. The layers of ice were smooth, suggesting the ice hadn’t been strongly disturbed during that time. This meant that either the impact happened more than 79,000 years ago or — if it took place more recently — any impact-disturbed ice had long ago flowed out of the area and been replaced by ice from farther inland. The researchers then looked at rates of erosion: they calculated that a crater of that size would have initially been more half a mile deep between its rim and floor, which is an order of magnitude greater than its present depth. Taking into account a range of plausible erosion rates, they calculated that it would have taken anywhere between roughly a hundred thousand years and a hundred million years for the ice to erode the crater to its current shape — the faster the erosion rate, the younger the crater would be within the plausible range, and vice versa. To calculate the statistical likelihood that the two craters were created by unrelated impact events, MacGregor’s team used recently published estimates that leverage lunar impact rates to better understand Earth’s harder-to-detect impact record. By employing computer models that can track the production of large craters on Earth, they found that the abundance of said craters that should naturally form close to one another, without the need for a twin impact, was consistent with Earth’s cratering record. Antarctica, Asteroid, Canada, Crater, earth, Glacier, Greenbelt MD, Greenland, Hiawatha Glacier, Meteorite, NASA, NASA's Aqua Satellite, NASA's Earth Science News Team, NASA's Goddard Space Flight Center, NASA's Operation IceBridge, NASA's Terra Satellite, National Aeronautics and Space Administration, Southwest Research Institute, Ukraine, washington d.c.